For a long time, wool, one of nature’s oldest fibers, was neglected by quilters. We were all “100% cotton or bust!” True you saw the occasional vintage wool quilt but it was likely a crazy quilt and hadn’t been quilted but rather tied. And old wool quilts were heavy! Even if they were colorful or interesting, hanging them for exhibition was a challenge. But some collectors adored wool, especially after being exposed to work like traditional Welsh quilts. See photos from The Welsh Quilt Centre to understand why Welsh wool quilts started to inspire quilters worldwide. American quilters in particular were resistant to using wool. We thought wool’s tendency to shrink was a drawback and we assumed wool anything had to be dry-cleaned. But somewhere about fifteen years ago, the tide turned. 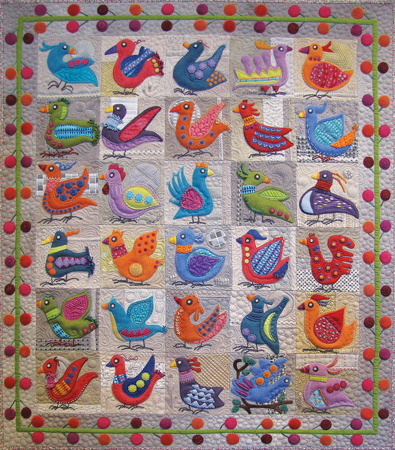 Sue Spargo, a quilter/folk artist from Ohio but originally a South African, had no built-in prejudice about the fiber. Rather she welcomed the intense colors achievable in wool fabrics and used vivid shades like lime green and hot pink in her work. She explored embellishing wool and expanded the traditional embroidery lexicon with new variations of the bullion stitch. Now a respected teacher and author, Spargo’s multi-layer wool stitched work is recognizable worldwide. In a parallel trend, primitive stitchery fans who had formerly been using wool threads in cross stitch and crewel–but not much wool yardage–discovered wool plaids and plains in dark homey colors like rust and deep green and took the fiber to heart. What ‘prim stitchers’ taught us was that wool didn’t have to be turned under neatly like traditional appliqué but rather its roughness and tactile charm could be used to advantage. While primitive-style projects turned up occasionally in quilt publications, the arrival of the primitive style in the quilt world as a huge influence began in 2010 and the following year, a magazine devoted to the style called Primitive Quilts & Projects hit the newsstands. Last year another publication titled Punch Needle & Primitive Stitcher became available. What is appealing about wool now is that it is available to quilt shops in smaller cuts. No longer do shops have to order enormous fat bolts of wool and hope it sells! Everyone can dabble in wool. When doing wool appliqué, the background fabrics don’t have to be wool as well. We’ve broken the fiber barrier! Quiltmakers are using flannels and even flat-texture cottons for their wool appliqué backgrounds. Recently at the International Quilt Market I noticed in addition to wool fabrics, kits, and wool-inspired books, that batting companies have taken up the wool banner. Hobbs offers two different weights and textures of wool batting. Hand quilters in particular have taken the Tuscany batt to heart. A revived Mountain Mist batting company spearheaded by Linda Pumphrey who literally ‘wrote the book’ on Mountain Mist quilt patterns, is just now offering a very soft and springy wool batt that’s 20% polyester and 80% wool. And watch the AirLite Batting Company, which is poised to enter the wool batting market with a new batt this Fall. If your customers are already working with wool in the folk-art Spargo-style, I saw new sizes of bullion needles at the Colonial Needle Company that they will appreciate. If you love wool, 2016 is going to be a very good year! Wonderful article on wool. Wool is a lovely fiber–natural, breathable and has a memory. Blending it with other fibers will get the best properties from all the fibers. Happy to see wool coming to the forefront in quilts, battings, stitchery and also in garments and artwear. Thanks for a great write-up on this classic fiber.